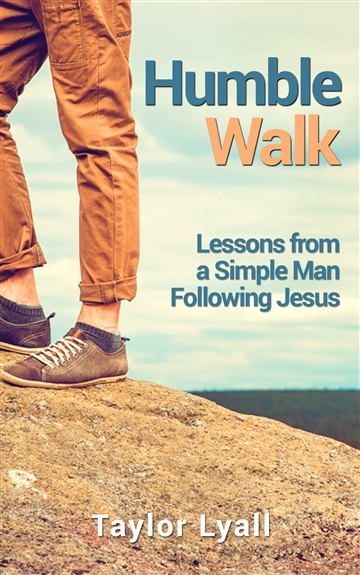 Humble Walk: Lessons From a Simple Man Following Jesus, is Taylor's first book.Taylor is passionate about Jesus, His people, and His work in the world. He is devoted to showing others their value in Christ, their need for Him and to be a father to the fatherless.Taylor lives in Chicago with his amazing wife Karen, and two daughters, Halle and Given. "Started this book at the beginning of a long flight, and devoured the whole thing before the plane touched down at my destination because I couldn't put it down.Taylor Lyall writes with simple clarity and balances his sense of humor with an even deeper level of honesty that makes this book a fun read and a boost for the soul. I would definitely recommend this book." "Humble Walk is a simple, honest book that chronicles one man's journey in following Christ. Taylor writes about the struggles and triumphs of following Micah 6:8 "...and what does the Lord require of you? To act justly and to love mercy and to walk humbly with your God." As Taylor shares how God has worked and is working in his life, you can sense his passion and excitement for others to know Christ in a deeper way. Humble Walk is an encouraging book that focuses the reader on the simplicity of life with Christ." "My old neighbor and friend I seem to run into a lot around Chicago, Taylor Lyall, wrote a book!Like it’s namesake, the book is simple. It’s 150+ pages of wisdom and experience of this man’s journey with God; however, just like anything with God, it’s also profound.I had so many moments with God whilst reading this book. Sitting on the Blue Line, standing in my kitchen, laying on my couch, and walking around my living room, all were moments where I encountered God. He totally used this book to encourage, affirm, and inspire me. Read it."